A young weeping willow lived on the edge of a riverbank. From her home she could see fields, hedges, a beautiful wood and a mountain. People and animals passed by her on the riverside track and would notice how her delicate branches dipped and swayed. “How lovely!” they all thought. But the weeping willow was not happy. As she looked about her she was always finding fault with herself and comparing her shape with other trees. “Oh,” she sighed “I wish I were taller and could reach high into the sky like that Poplar tree over there”, or “How I wish I had a good wide strong trunk like the Oak, I am so skinny and thin.” or “Ah, look at the interesting shape of the branches in the Scots Pine, my branches are so droopy.” And she went on feeling miserable about herself. 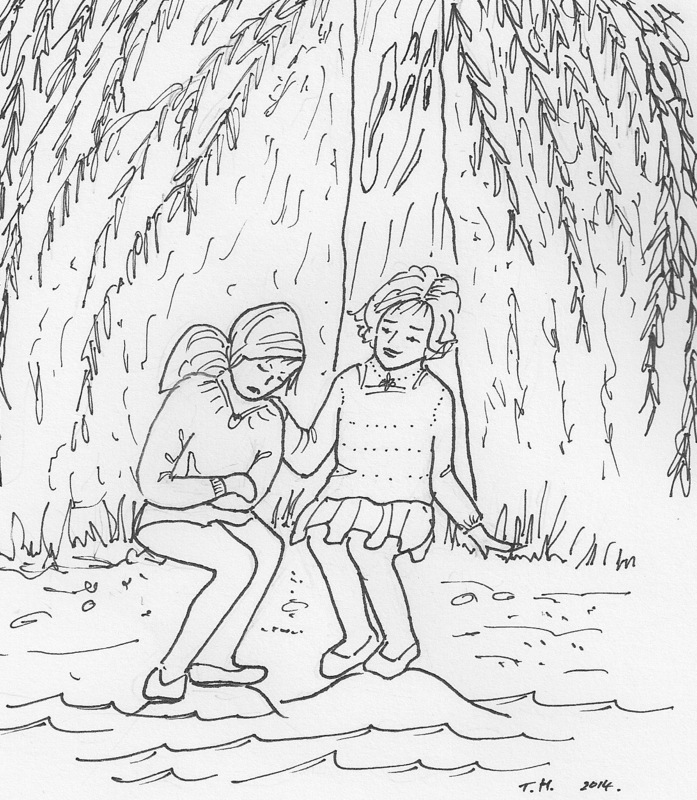 One day two girls came by and sat beside her on the riverbank. “What is your secret?” asked her friend. The girls stood up. Sally stroked the bark of the Willow. Suddenly she felt better. The girls wandered off along the riverbank. The willow tree gently waved her branches, she felt better too. It made sense to be happy with what she was and to learn to appreciate her finer points instead of envying other trees for what they were. She decided she would be happy to admire others, but not to wish she could look like them, because everyone is made to be different and that’s how it is, and that’s how it should be. How did you feel when you heard the story? Did it remind you of anything in your life? Why was the weeping willow unhappy? What did it want to be like? Why did the tree change its ideas about wanting to be different?